In line with the OECD Principles and Guidelines for Access to Research Data from Public Funding, national and international funders are increasingly likely to mandate open data and data management policies that call for the long-term stewardship of research data created as a result public funding (see Current Best Practice for Research Data Management Policies). Such data should be FAIR (Findable, Accessible, Interoperable and Reusable) and is essential both for research transparency and accountability and for reuse in broader integrative and transdisciplinary research. Data themselves are increasingly viewed as a fundamental component of research infrastructure and one which carries benefits for society and the economy. Data stewardship is performed by a wide variety of data repositories, national and international in scope, covering a variety of domains, responsible for different volumes and types of data and with mission statements and user communities that require different services and a range of ‘levels of curation’. 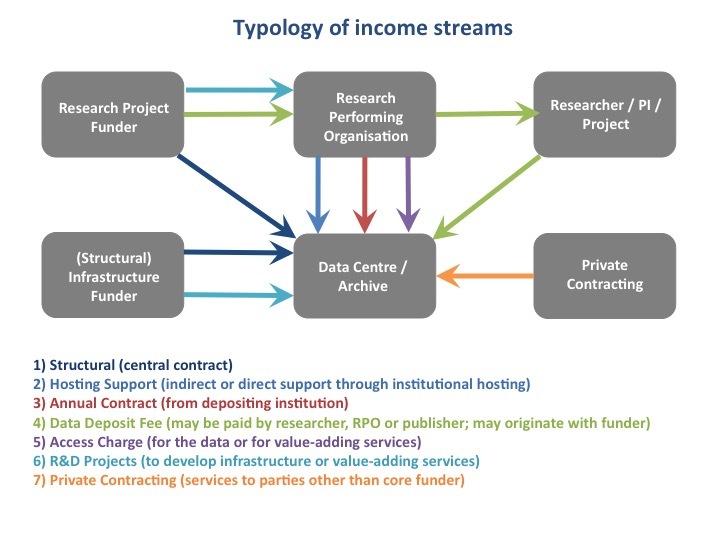 Although many established national and international data repositories have core streams of income from research funders, these sources of income are generally inelastic and may be vulnerable (whether to short-termism, ill-considered re-prioritisation or attempts to pass responsibility to other budgets). There is a pressing need, therefore, to explore new and innovative income streams and to establish sustainable business models for data repositories. How are data repositories currently funded? What innovative income streams are available to data repositoreis? What means of restraining costs are available? How do income streams match willingness/ability to pay of various stakeholders? How do income streams/willingness to pay fit together into a sustainable business model? The economics of data services more generally – including value proposition, cost recovery, stakeholders’ willingness to pay and overall business model – will need to be robust in order to be sustainable. It is also important when developing sustainable business model for data infrastructure to consider the value proposition, costs and benefits for different levels of stewardship provided, from lightweight curation to value-adding services. The scope will extend beyond the diversification of income streams and development of value-added services. It will include consideration of options to enhance operational efficiency of operation, including but not limited to automation or crowd-sourcing as alternative or complementary methods of curation. The project will perform a thorough economic analysis of possible business models, assessing their viability and the value of the services offered and exploring the alignment of these with stakeholder and beneficiaries' willingness to pay and budgetary authority. This task will be conducted in two stages: 1) an economic analysis and presentation of business models; 2) the analysis and business models will be tested through a focus group meeting with stakeholders and refine the analysis. The final deliverable of the project will be a report summarising findings and containing policy recommendations to promote sustainable business models for data infrastructures. consider opportunities for cost optimisation at a repository and system level. The second workshop will take place in March 2017. It will present the economic analysis of various income streams and business models and test these with stakeholders.